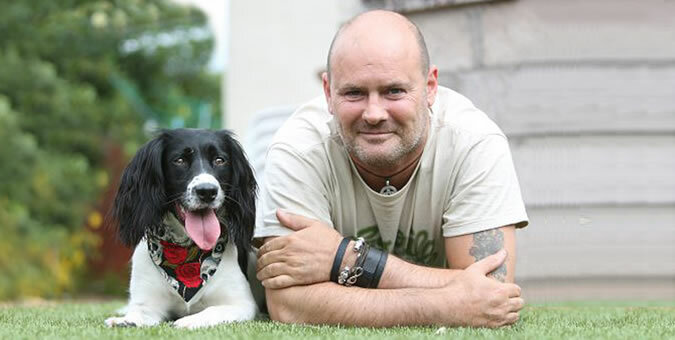 BRAVEHOUND ~ Paul Wilkie & Irma ~ are finalists in Soldiering On Awards 2018. 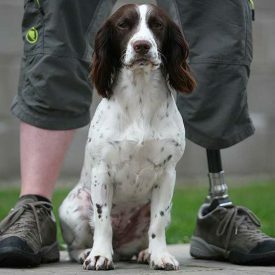 Bravehound is a Scottish charity supporting former service men and women and their families, providing trained dogs to support veterans. Paul was a Royal Engineer serving in Ireland, Bosnia and the Falklands. A few years ago Paul began suffering PTSD very badly when the thoughts and experiences of those times started to debilitate him. Paul’s marriage broke down and he was homeless. He lived in a tent in the woods. Until a chance encounter saw Bravehound stepping in and giving Paul a house and a dog called Irma. Irma is the first designed dog to support the relief from symptoms of PTSD. Paul’s animal partner Irma kick started a belief in himself. Irma awakens Paul when he has flashbacks and never left his side in the hospital other than ICU. He was in a coma for 10 days after medical issues took hold and was given 36hrs to live. Irma stayed by his side. He made it out and now they both have a companion in North – one of 3 Ducks. They also have a cat. Caring for them has helped Paul tremendously and is now getting life back on track. Paul and Irma both deserve the animal partnership award.